Alumnus Sriram Subramanian is co-founder of Callido Learning, an education technology initiative created by IB Diploma graduates to develop 21st century skills for all students. He received his IB Diploma from Dhirubhai Ambani International School. 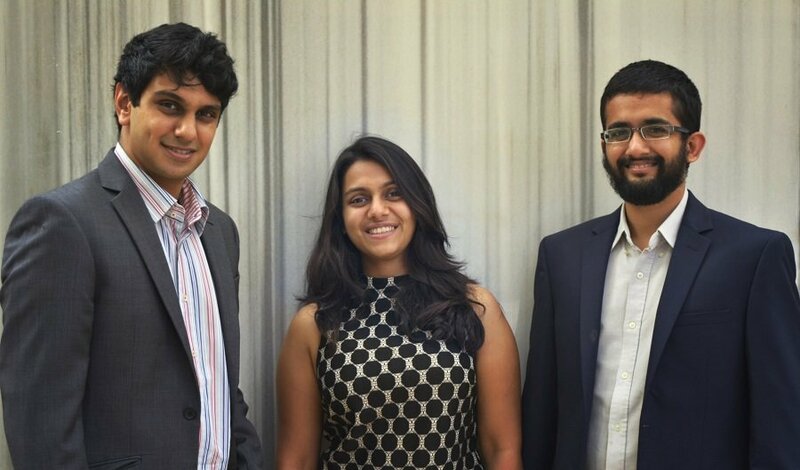 Pictured from left, Callido Learning co-founders Sriram Subramanian, Madhu Agrawal and Chinmaya Kulkarni. I completed my IB Diploma in 2006. Since then, I majored in Economics and South Asian Studies at Brown University, worked in campaign finance in the US, advised on transport planning and urban policy, studied Transportation and Logistics at Imperial College, London and UCL, worked as a tax advisor at PwC and founded Callido Learning, an edtech initiative. And it’s not because I can’t make up my mind about things! I consider myself extremely fortunate to have been able to move seamlessly between completely different industries in different parts of the world and adapt quickly. Remember the bigger picture – each assignment is not about the deadline but is an integral piece of a jigsaw puzzle that’s making you ready for university and work. Looking back, I realize that while we’re in school or at university, we obsess over whether we want to study mathematics or chemistry or psychology; we miss the larger picture. Once we’re out of this educational world, the real world doesn’t care for what subject we studied. It only cares for what skills that subject allowed us to develop. Why did I return to the world of education? The inquiry-based Diploma Programme (DP) was my first experience of a skills-based program. Then, I didn’t appreciate the potential of what the DP was trying to achieve. Nine years and a few careers later, I see how the extended essay, theory of knowledge (TOK) and creativity, activity, service (CAS) were invaluable in emphasizing and developing rigor of thought, research skills, good written communication and social skills. Having appreciated the importance of these skills in the workplace, I connected with another IB alumni and a friend from Brown University to find a way to formalize the development of these crucial skills. We wanted to bring about a shift in the way in which education is viewed – turning the spotlight on skills and big ideas. Together, we founded Callido Learning, an education initiative which creates interactive digital content and leverages data to assess, develop and monitor students’ skill development. For us, the most rewarding part of our work is connecting with students who are currently pursuing the IB Middle Years Programme (MYP) and DP and giving them hope that the rigor of the program is worth it! On a more serious note, it is immensely rewarding when we see a perceptible shift in students’ attitudes towards the programs from a collection of assignments to a process of inquiry with a larger goal. What I would say to students today? 1. Think about careers in terms of skills. Every industry is rapidly changing and will not look like it does today by the time you make it to the workplace. So don’t focus on learning things that will become obsolete, focus instead on the underpinning skills which the industry will always demand. For example, if you’re interested in engineering, instead of learning of the newest technology in suspension bridges, focus instead on developing systems thinking and modelling skills. The ‘latest technology’ will be replaced as soon as a new technique is developed, but these thinking skills will be your bedrock for innovation and adaptation to a new way of doing things. More importantly, if you change your mind about engineering and want to pursue a different career instead, your strong thinking ability will allow you that flexibility. 2. Connect your career skills to your subject choices. Why is it important for lawyers to learn history? It’s not because they need to know everything about the past, it’s because history is an excellent subject for developing the ability to analyze large amounts of information. That is a skill that lawyers must have. Similarly, mathematics and computer science emphasize logical, structured thinking; environmental systems and economics are great for systems thinking and modelling, and language develops the all-important ability to communicate clearly. 3. Finally, make the most of your IB journey. Yes, it can get challenging at times, but remember the bigger picture – each assignment is not about the deadline but is an integral piece of a jigsaw puzzle that’s making you ready for university and work. The end point is well worth it. Sriram Subramanian received the IB Diploma in 2006 and graduated from Brown University in 2010. He has lived and worked across the US, UK and India and is a co-founder of Callido Learning, an education technology initiative by IB alumni to develop 21st century-skills for all students.